Norwich Road Runners organised the annual Broadland Half marathon. The event was due to be held in March but due to adverse weather conditions it was postponed. This proved to be a good choice because the 273 runners were met with ideal weather conditions. 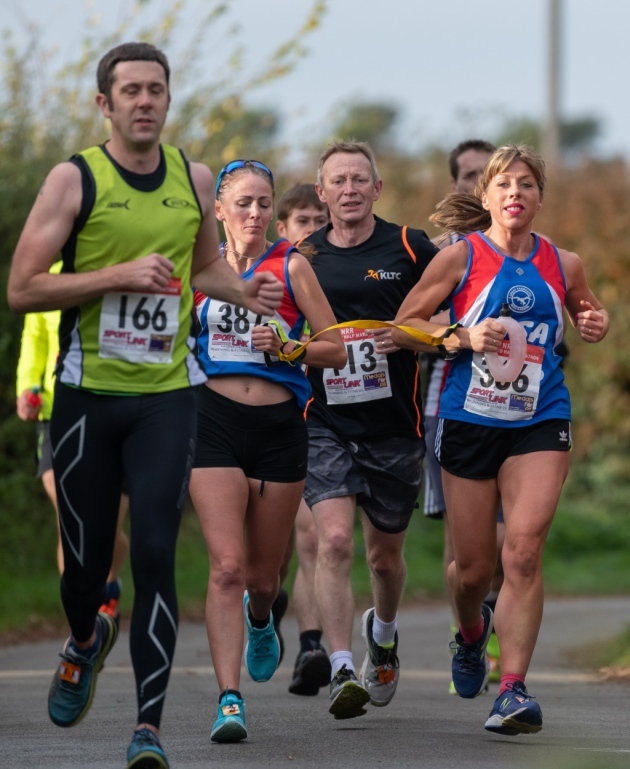 The sell-out event started at South Walsham Village Hall and took runners through the Norfolk countryside, including through the pretty villages of Ranworth and Woodbastwick. The roads were quiet but the marshalls did a superb job, giving plenty of encouragement and keeping the runners safe. Eleven Great Yarmouth Road Runners (GYRR) took to the start. Terry Hubbard, who was planning to have a steady run, was first home for the GYRR team. Terry has covered high mileage in recent races as he has competed in some ultra distances this year. His fitness from these events shone through in the race as he advanced through the pack, having a fast second half. He came 4th in his age group. Mark Stone, Kevin Fuller and Paul Reeve all finished in close succession, dipping under the 1 hour 40 mark. The first ladies home for GYRR were Lisa Smith and Penny Studley. Lisa, guided by Penny, was aiming for a personal best time. She completely obliterated her previous best of 2 hours and 3 minutes to run a sub 1.50. This is a truly outstanding result for Lisa who has been running for several years. Her current form is proving to be such an inspiration to her club mates, especially as Lisa is visually impaired. Ivan Lees and Pauline Leeves were next to finish. As long-standing members of the club, it was good to see them both finish comfortably under two hours. Pauline was surprised to win 3rd place in her age group as she has had a recent break from racing due to illness; a rewarding comeback. Birthday girl, Elise Mitchell, had a double celebration as she managed to sneak a two second personal best. Rachel Acamon-Carbonelli and Leigh Taylor completed the GYRR team by finishing with smiles on their faces on a beautiful day at a superb event. The half marathon will return to its usual slot in March next year but moves to a new venue. It will be at the Dinosaur Park and be renamed the Ringland Half marathon. Thank you to Norwich Road Runners for their excellent organisation and friendly welcome. Terry Hubbard 1.36.51, Mark Stone 1.37.38, Kevin Fuller 1.39.34, Paul Reeve 1.39.49, Lisa Smith 1.49.48 (PB), Penny Studley 1.49.48, Ivan lees 1.57.50, Pauline Leeves 1.58.08, Elise Mitchell 2.12.26 (PB), Rachel Acamon-Carbonelli 2.17.56, Leigh Taylor 2.30.57.